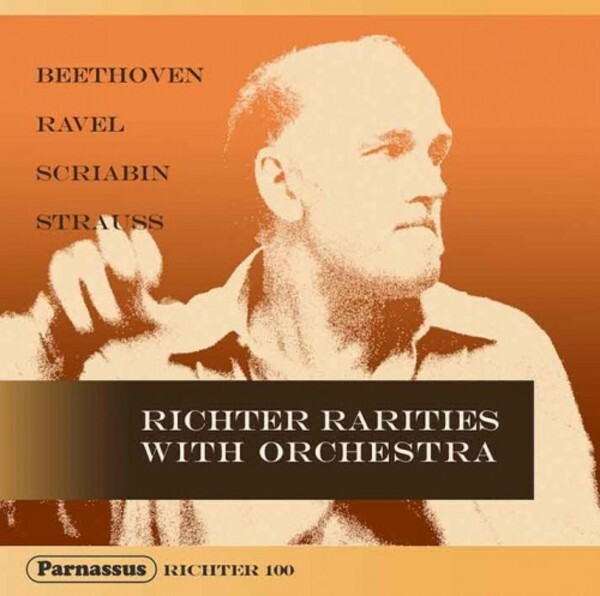 Both the Beethoven Rondo in B Flat and Ravel’s Concerto for Left Hand were issued as parts of boxed sets containing mostly otherwise-common items. The original sets have both been out of print for more than two decades and are collectors’ items. The set including the Beethoven was suppressed by legal action shortly after it was issued. A recording of Sviatoslav Richter playing Scriabin’s 'Prometheus' was previously issued by the long-gone Russian Disc label and has been reprinted by Melodiya. However, the version on our disc is Richter’s first performance of that work, with the same conductor and orchestra, previously available only on a private issue from Russia. It is in surprisingly good stereo sound. Richter’s performance of the Strauss Burleske from Russia was originally issued by the Russia Revelation label and is currently available. However, the performance on our disc comes from Romania. It was issued only there and on three private releases.